Growing up in Hamburg, our parents were a “City Boy” and a “Country Girl”. 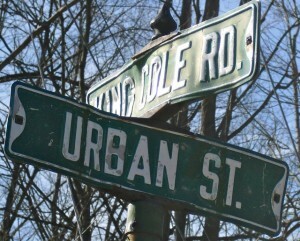 We always used to chuckle over the fact that, in our very tiny town of Hamburg we had a street called URBAN street. My father was raised in Manhattan, by a father who was a professional artist. It was a tough life. Daddy was “street savvy” by the standards of his adopted town of Hamburg. Little did we know that while his own father, our grandfather, studied at the Art Student’s League in New York City, Joseph Urban, the designer of the Gingerbread Castle taught classes there. Maybe they knew each other? We’ll never know. Small town life was not for me, so I moved away from and went to work in New York City. I became an Urban Studies and Economics major in college, which is a little ironic. I did not learn until 2011, that our little tiny “Urban Street” was named after this magnificent and important artist, Joseph Urban. I had never even been on the actual street, “Urban Street”, until February 2012, when I captured the image of the Urban Street sign for the photo collage. But despite my new found exposure to Urban’s genius, what I have learned from working on this digital library project, is that my personal connection to “place” is less about what it looked like on the outside, and is more about what happened to the people who visited there: their reactions, their memories, and their emotions. The Gingerbread Castle is some sort of sacred homestead to many people’s childhoods – living just a short little way down the road, 800 yards away to be exact, it was as if we were making a journey to another world, a magical world, entirely. My father, as a little boy, would ride a subway alone and watch his magical Yankees play… we would drive travel in a car, or walk down a few blocks and plunge into the world of magical fairy tale characters. But one character was still hidden from my view? The Gingerbread Castle Digital Library by Judith L. Panagakos is licensed under a Creative Commons Attribution-NonCommercial-ShareAlike 3.0 Unported License.